Legos are a versatile medium for fans to use to recreate trailers for hotly anticipated films or re-enact entire scenes from movies. For accomplished and talented stop-motion artists, it also allows for wholly original (well, while working with existing intellectual properties) works of fan fiction that can show off an impressive attention to detail as well as a huge cache of originality. And while Nazi zombies may not be the most original idea, having those same undead creatures of hate explode into actual viscera is a pretty unique and entertaining sight to behold. YouTube user Forrestfire101 (a.k.a. 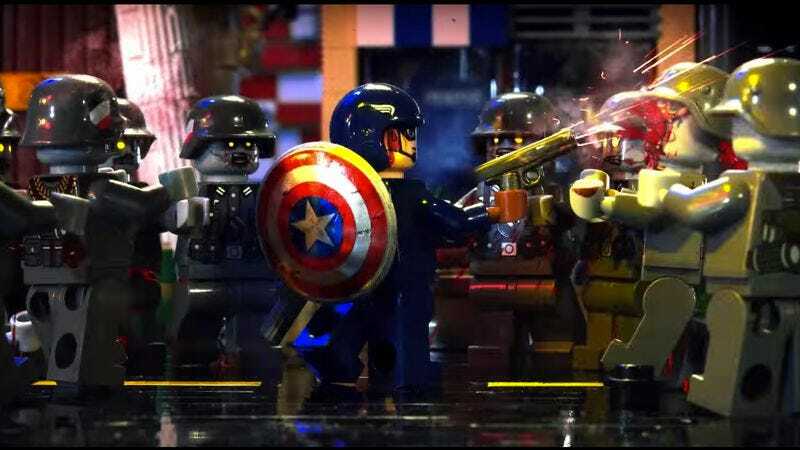 Forrest Whaley) has assembled a stop-motion short using custom Legos and some mass market pieces to create this bloody, action-packed piece of fan fiction. Captain America finds himself in a town overrun by Nazi zombies and must fight his way through the horde, and soon finds himself entangled with other characters from the Marvel Cinematic Universe. It’s an exciting short that displays real talent in the stop-motion medium as Whaley uses lighting, music, and impressive poses for the characters to create an incredibly gory but fun short film that is as brutal as it is entertaining.